“Get Rich Quick” is for losers. Success takes time, patience, and a willingness to work hard. Even if you are starting with nothing you can succeed if you are willing to hustle and put in the work. 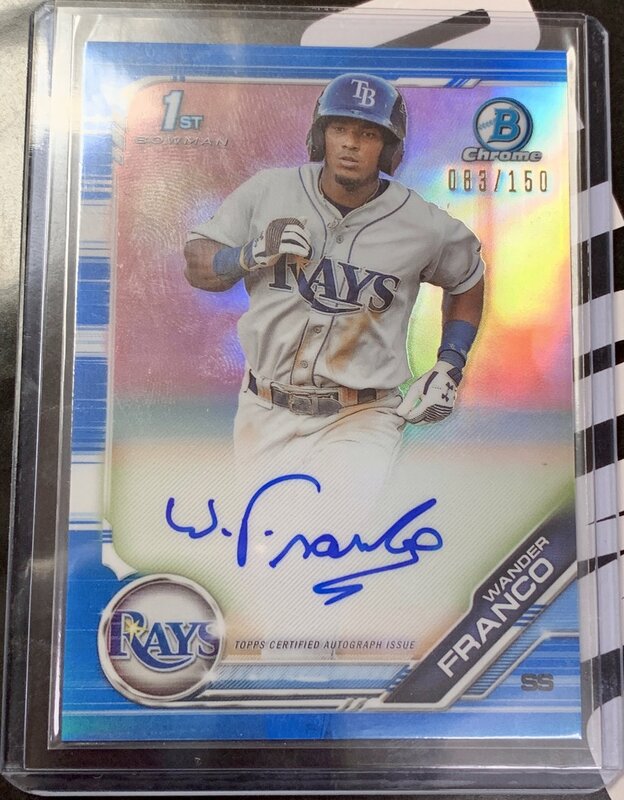 This Wander Franco came out of the case I sold back to my LCS! In April 2019, Bowman hit the shelves as one of the most hyped products of the season. Many collectors willingly paid prices to roughly triple the cost distributors paid to Topps. I loaded up a box full of Cubs cards and sent it up to Beau Thompson in Madison, Wisconsin. In return, I received a package of various “odd ball” issues, including some 1983 Gardner’s Bakery cards! After 6 months of no activity, Sportlots considers a “box” abandoned. The contents of these boxes were put up for a charity auction, and in this post we will discuss the results! Yup! The packaging for the second set took a big step forward! The second Topps 582 Montgomery Club set has arrived, and it is the 20 card sticker set which was announced in the original membership materials. I really, really, like it, but lets not get ahead of ourselves and dig in a little deeper. I opened a value pack of 2019 Topps Gypsy Queen and wrote a review of the product. While I’m not a fan of the concept, I think those that love it will be very happy with the 2019 edition! I recently put out a Twitter poll asking what topics you were interested in hearing more about in the coming months. You responded. For the first several years of his career, Mookie Betts may have been one of the most overlooked superstars in the game when it came to the popularity and prices of his trading cards. The Topps Opening Day brand debuted as a retail exclusive set for the 1998 season, and it returns again for 2019 in both hobby and retail outlets. The kid centric release contains 200 base cards and a slew of inserts that focus on the “lighter side” of the game. Here is the complete 2019 Topps Hobby release calendar plus I’ve included an easy to share, easy to reference guide! Collectors seem to fall under two camps when it comes to Panini products, especially Donruss. One group loves the “retro” feel and the lower price point. The other group can’t get past cards without MLB logos. The 2019 version of Topps Heritage brings us into the 70’s with the grey bordered 1970 set being the focus. It’s a perfect set builders product, it still has hits to chase, and the inclusion of errors, box toppers, and other variations provide some variety that many other products don’t have. Postage costs are a big expense component when selling sports cards and we should do our best to ship in the most efficient and cost effective manner. This week we are going to take a look at 7 Nolan Ryan cards from my personal collection that I find interesting. Action shots, uniforms, and even a little blood find their way into the list of cards! If you grew up in the 80’s, it was hard to not be a Bo Jackson fan. Bo was everywhere. Bo broke bats. Bo played football. Bo wore Nike’s, and as they taught us, Bo Knows! In 1963 Fleer created a set with current players that directly competed with Topps. The single series 67 card set drew the ire of Topps and created an interesting story of cards, cookies, player exclusives, and legal battles that would play out over the next two decades. Some say the hobby has never been stronger. Others will say we ready for a massive crash. Based on early reports, 2019 Topps Series 1 could be the product that shows which of these scenarios is closer to reality. In Confessions Of A Baseball Card Addict, Tanner Jones tells how he bought, sold, and traded his way into the largest Jose Canseco collection in the world. He shares the lessons he learned about collecting, and more importantly what he learned about himself along the way. 1987 Topps: A Great Set, or the Greatest Set? This is a set that is hated by some, but loved by many. On the 25th anniversary of their first wood grain bordered set, Topps brought back the lumber for the 1987 release. If you are looking for a place to search an inventory of millions of cards, see front and back scans of each one, and be able to combine purchases from multiple sellers into one low cost shipment, then COMC is a site you need to check out.